However, you also have a friend in the government – one of the very few who doesn’t work for the Stasi and isn’t reporting on you – and you find out from him that the East German government is going to build a large wall to keep East German citizens inside East Berlin and from defecting to the western half of the city. When he tells you that the government is almost done acquiring the materials needed for the wall, you decide now is the time to make a break for it. As it currently stands, there are armed border checkpoints that lead into the Western half of the city; the most popular of these crossings is known as “Checkpoint Charlie”. At this time, though, the checkpoint consists of a small guard tower, some sandbags, and a wooden gate – nothing too big that you couldn’t get through. You quickly pack what little belongings you have into your Trabant, fill it with fuel and two stroke oil, and wait until the dead of night. At 0200 hours, you drive your Trabbie to the road that leads to West Berlin – to freedom. There is one guard, but he’s in the tower, and not paying much attention as you slowly scope out the checkpoint. Your Trabbie only makes 26 horsepower; you’re going need to get as much speed as possible if you want to make it. After driving about a kilometer in the opposite direction from the checkpoint, you turn around and face it. This is the moment of truth – you either make it to freedom or die here, alone. After giving it some thought you’re ready to chance fate. You select first using the column shifter, and smoothly but hurriedly engage the clutch. The small 600cc two stroke two cylinder slowly but surely spins up – you need every meter you have to get speed. Rowing through second, and then third, you only have less than 500 meters to go – but you’re close to the Trabant’s maximum speed of 100 km/h, which in a city street feels very fast. Rapidly closing in with just 300 meters to go, the guard notices you speed towards him, and gets on the street motioning for you to stop. You made it this far; there’s no way you’re going to stop for him or anyone. Realizing that you’re not going to stop, he levels his AK at you, and starts to fire from the hip. As your ears dance to the beat of Kalashnikov’s brain child, and of your Trabant’s two-cylinder motor, he scores a few hits on your Trabbie’s Duroplast body. Oh well, you’ll worry about that when you get to the other side. The guard’s AK runs out of ammunition, and as he sees you getting ever closer, quickly side steps to avoid being hit. It was at this moment that you felt time slow down – as if life is in slow motion. You’re just 100 meters away, still maintaining 100 km/h. The distance closes – 50 meters, 30, 20, 10. Rapidly approaching the sandbags and wooden gate, you brace yourself mentally for impact. 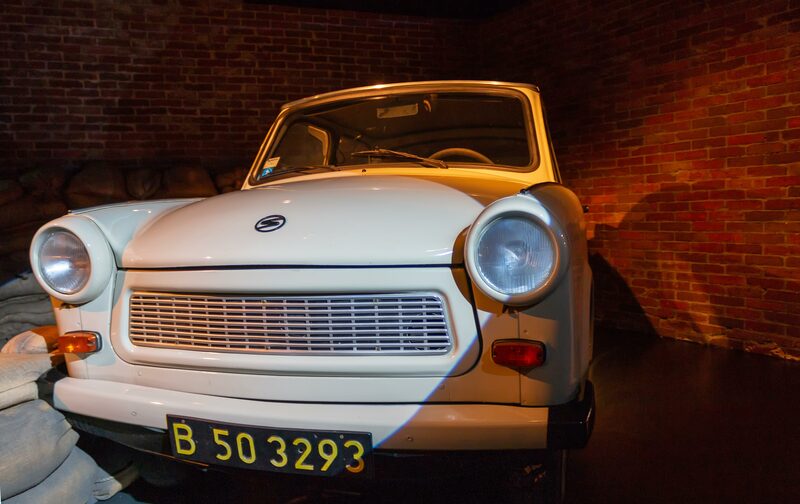 An aluminum car wouldn’t have survived the impact, but your Trabant’s advanced Duroplast body easily took the blow. After losing half of your speed with the initial sandbags, you plow cleanly through the wooden gate, almost coming to a stop. The freewheeling clutch keeps the car going, so you quickly engage first and keep going to the Allied side. The guard comes out to resume shooting, but seeing that you crossed out of Eastern Germany, holds his fire. You made it to freedom.